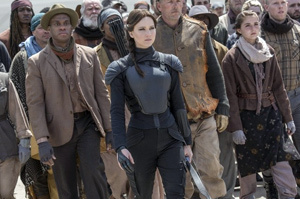 Hunger Games: Mockingjay — Part 2 probably never should have been made. Mockingjay — Part 1 felt as though it were marking time until the grand finale. Parts 1 and Part 2 should have been one movie. Having offered that necessary caveat, I’m happy to report that the finale has arrived, and if it’s not a masterpiece, it’s good enough to keep fans happy. Jennifer Lawrence carries Part 2 through its many dark moments as rebel forces stage an attack on the Capitol where the fiendish President Snow (Donald Sutherland) struggles to save his diminishing reign. Lawrence’s Katniss Everdeen continues as one of the more interesting screen heroines, a fierce fighter who’s given just enough emotional shading by Lawrence to be more than a symbol. And, yes, Lawrence deserves tons of credit for holding the line on a character that easily could have gone off the rails over the course of four movies. This helping of Hunger Games qualifies as essential viewing for those who’ve seen the first three movies. It’s probably of no interest to those who haven’t. Say this, though: Overall, the series has been a well-handled affair that shamed no one as it toyed with some intriguing ideas about violence, media, propaganda, and betrayal. True, many of these “ideas” were served at the kids’ table, but no matter: At least, there was some meat on the Hunger Games’ bones. I won’t attempt to summarize the final movie’s plot because it consists mostly of embellishments added to a central concern: Overthrowing Snow, thereby putting an end to his horrible tyranny over the 13 Districts of Panem. The rebels are led by President Coin (Julianne Moore), a woman who may not be the savior she pretends to be. She’s assisted by Plutarch (Philip Seymour Hoffman), a strategist and propagandist. That brings me to what may be the essential things to know about Mockingjay — Part 2. The proceedings are laced with a surprising amount of melancholy. Instead of pushing toward a celebratory and triumphant conclusion, Mockingjay exudes a sadness that begins the first time we see the late Hoffman on the screen. His appearance has an unintended mournful quality that echoes the way the movie tries to remember those rebels who have died fighting for freedom. A couple of grandly conceived action sequences — one involving a flood of oil and another set in a tunnel — help fend off boredom, although director Francis Lawrence doesn’t always make it clear who’s fighting whom. The final movie (and the series) actually acknowledges both loss and consequences, a good thing in a story that’s aimed mostly at teen-agers. Let’s be thankful that some of the more colorful characters haven’t entirely been jettisoned from this last chapter: Elizabeth Banks’ Effie Trinket makes what amounts to a cameo appearance. Woody Harrelson’s Haymitch Abernathy drops by from time to time, as well. So let’s bid goodbye to Katniss, as well as the generally vapid men in her life: Peeta (Josh Hutcherson) and Gale Hawthorne (Liam Hemsworth). Mostly, tough, it’s Lawrence who deserves congratulations for fitting into a series she probably has outgrown and for never shortchanging either the audience or Katniss. That’s saying something. Quite a lot, really.